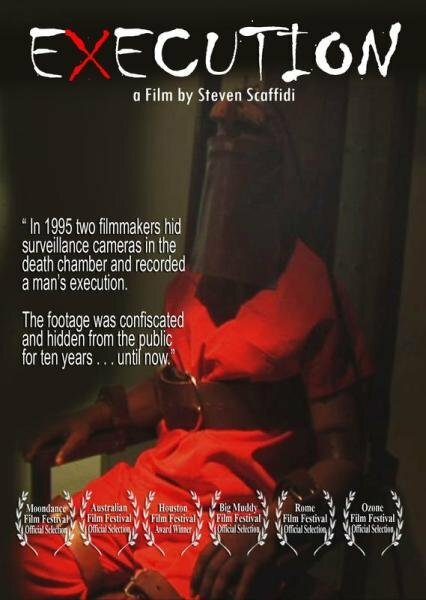 In 1995 two filmmakers hid surveillance cameras in the death chamber and recorded a man's execution by electric chair. The footage was confiscated and hidden from the public ... until now. "This movie will take you closer to an actual execution than any film ever made. It's truly groundbreaking." 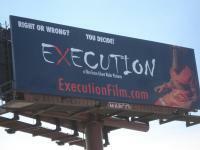 "Execution" is a film about the final days of man's life on death row. This movie is the first of it's kind and features a real condemned man, a real prison warden and a real priest playing roles that they actually lived in their own lives. 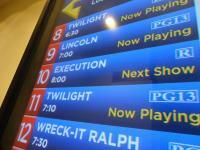 The film has screened by invitation at several major universities across the United States and in the United Kingdom. 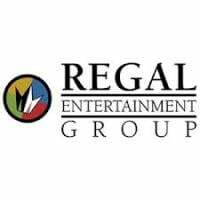 It has also screened in select theaters for a series of one-time events sponsored by Regal Theaters and Amnesty International. Even though the filmmakers don't hide the fact that this movie is a dramatic feature film, many people believe that some scenes in the film are real. The creative objective of this movie event is to take the viewer as close to the execution process as possible. The final scene of the film was shot in real time to achieve this goal of realism. As a viewer, you decide if executing a man in the name of justice is right or wrong and you decide what's real and what's not. WILLIAM NEAL MOORE - "The Condemned Man"
Billy Moore spent 16 years on Georgia's death row. He came within 7 hours of his own execution before he received a stay, largely due to the forgiveness of the victim’s family and the intervention of Mother Theresa. Billy is the only unconditional free man in America to have admited to murder and convicted of the crime. DONALD CABANA - "The Warden"
Don Cabana is the author of the best-seller "Death at Midnight: The Confession of an Executioner". He served as the warden of the Mississippi State Penitentiary at Parchman and has carried out 4 executions during his 30 years as a prison warden. FATHER JOEL LaBAUVE - "The Priest"
For over ten years, Fr. Joel has ministered to hundreds of condemned men while serving as the chaplain at the Louisiana State Penitentiary, also known as "Angola". Fr. Joel has "walked the mile" side by side with the condemned, heard final confessions, and witnessed many executions over the years. .
Steve is an award-winning writer, producer, director and the managing partner of Ghost Rider Pictures. His body of work includes the aclaimed films, "The People's Story: The Devastation of Central America"", "Forgotten on the Bayou: Rockey's Mission to the White House" in addition to "Execution". He created New Line Television's "First Date" and he's the recipient of the "Humanitarian Vision Award" in addition to many other accolades over his career. 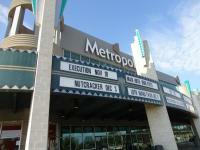 In this groundbreaking screening event, select theaters across America and the United Kingdom become execution chambers as a limited number of audience members are invited to enter the witness room and sit front and center for the final days of a man’s life on death row and ultimately his execution in the electric chair. 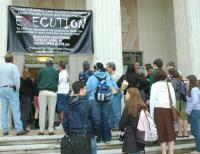 Nearly 1,000 people packed the McAlister Auditorium on the campus of Tulane University to see "Execution". ​​“This is a refreshing departure from the way capital punishment is usually portrayed in films, with an emphasis on the profound effects executions have on those most intimately involved." "You watch this film and what you've seen is an execution inside one of America's Execution Chambers." "The film is amazing! I can't stop thinking about it!" 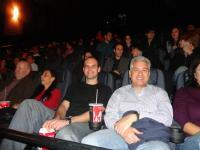 "We were so excited that filled the theater. It was a great event. We got students to think about the death penalty in a lot of different ways then they could imagine before they came this evening." "It was brilliant! 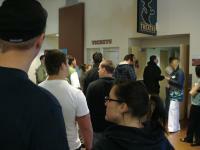 This was our biggest turnout!" "It's real. We were holding hands during the execution." "Nobody took their eyes off the screen. There are some incredible things going on in this film." THE NEW WAVE: "Tulane Prepares for Execution"
Does the death penalty represent legal justice or an antiquated and immoral institution? Whatever one's opinion, the death penalty has been one of the most debated legal and moral issues of the past generation. The death penalty will take the stage at Tulane on Tuesday (April 10) as the Tulane University Criminal Law Society hosts both the world premiere of the gritty film "Execution" and a death penalty forum. 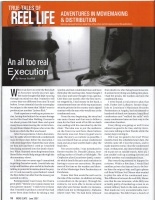 ROME GEORGIA NEWS: "Death Row and Mass Incarceration in the United States: The New Racism?" William Neal Moore, who came within seven hours of execution by the state of Georgia, will guide the Berry community in a discussion of race, prison and the death penalty. THE GUARDIAN: "Dead Man Talking"
Campaigner Billy Moore was once only seven hours away from the electric chair. Erwin James meets the only self-confessed murderer ever released from Death Row. THE DAILY RECORD: "Execution Film Star Was On Death Row"
ELLENSBURG - Filmmaker Steven Scaffidi wanted to portray the reality of death row with his movie "EXECUTION," which was shown Wednesday night at Central Washington University. So he used a real death row inmate, a real warden and a real death row priest in his film, which tells the fictional story of two filmmakers who made a documentary about the last seven days of an execution. CBN: "Billy Moore - Living on Death Row"
The year was 1974. Twenty-two-year-old Army Private Billy Moore returned from deployment in Germany only to find that his wife was involved with a drug dealer and addicted to heroin. NATIONAL CATHOLIC REPORTER: "The Clemency of Billy Neal Moore"
Last week, New Mexicans celebrated a great victory for justice and mercy: Governor Bill Richardson signed into law a bill abolishing the death penalty. . . This great turning point took me back nineteen years to another miraculous time, the campaign to stop the execution of Billy Neal Moore, which led to one of the great spiritual lessons of my life.